GOOD NEWS! 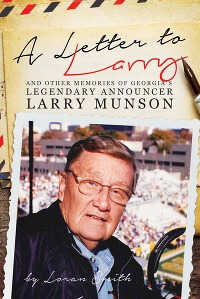 GREAT AMERICAN COUNTRY FEATURES KATHYMILLERTIME’S ARTICLE AND SLIDESHOW, TAILGATING THROUGH THE SEC! SO HAPPY TO COLLABORATE WITH GREAT AMERICAN COUNTRY. Celebrate the special traditions and unique tailgating spots of each of the 14 Southeastern Conference schools. 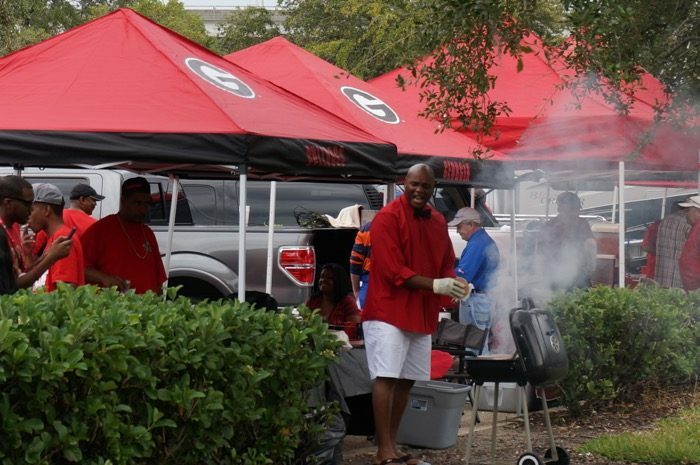 Kathy Miller has traveled to all 14 SEC schools, capturing tailgating experiences at each school. 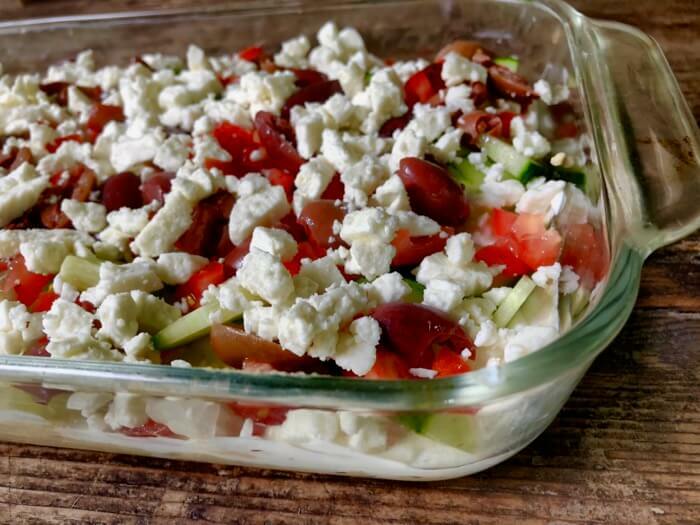 She has gathered recipes from fans and alumni, taken hundreds of photographs of tailgates and landmark buildings and explored the special traditions celebrated at these schools. Traveling to a rival’s away game is a must for any SEC loving fan! Ole Miss fans take tailgating to a whole new level. 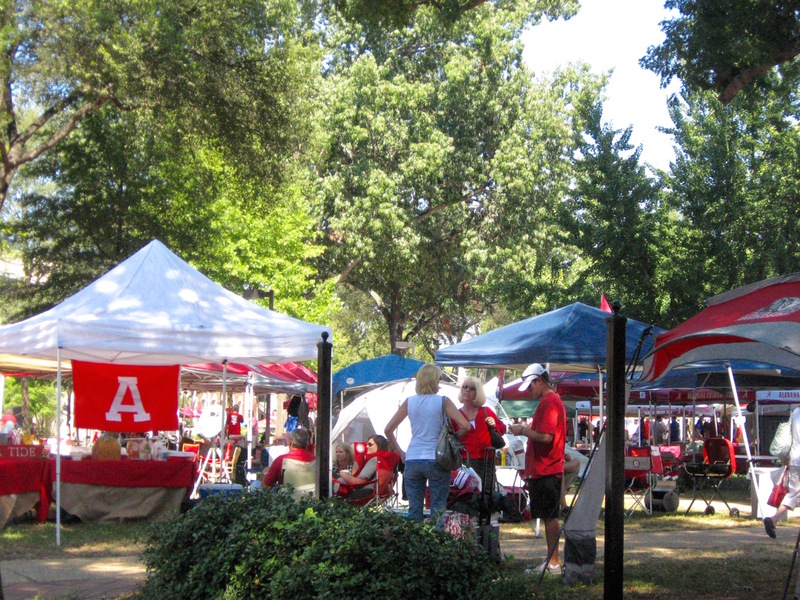 The Grove is a 10-acre, tree-filled green space nestled between the university and Oxford, MS. No cars are allowed, just people and miles of red, white and blue tents. Elaborate table settings with crystal chandeliers, fabric-draped tables and silver serving pieces set with an array of beautiful food are the norm here in Oxford. The Hotty Toddy is their cheer, and even the portalets are luxury mobile toilets, named Hotty Toddy Potty and Hotty Toddy Potty Too. Auburn is famous for toliet papering the two oak trees at Toomer’s Corner after a victory. 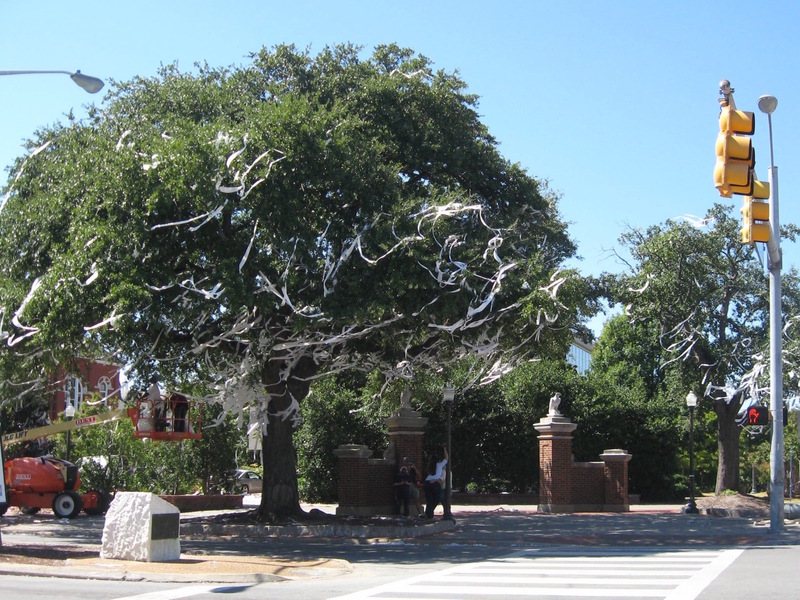 Unfortunately, the trees were poisoned by an Alabama fan after the Tigers dismantled the Tide. Now, the trees have been replaced waiting for Fall 2016 to renew the rolling of the trees tradition. Toomer’s Drugs is the “corner drugstore,” famous for its fresh squeezed lemonade, and you can be sure that all tailgates include some form of lemonade or dessert with a lemonade twist. 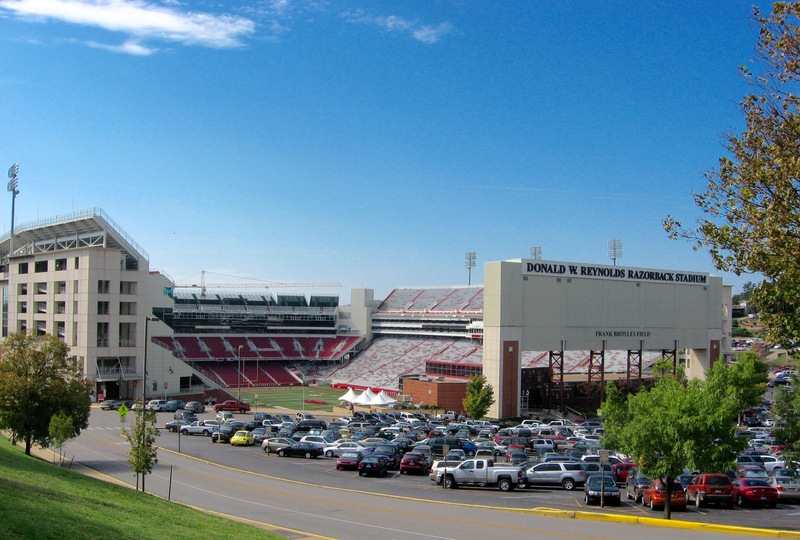 With a team named Razorbacks, one must assume the only BBQ meat served at most tailgates is pork, pork and more pork. 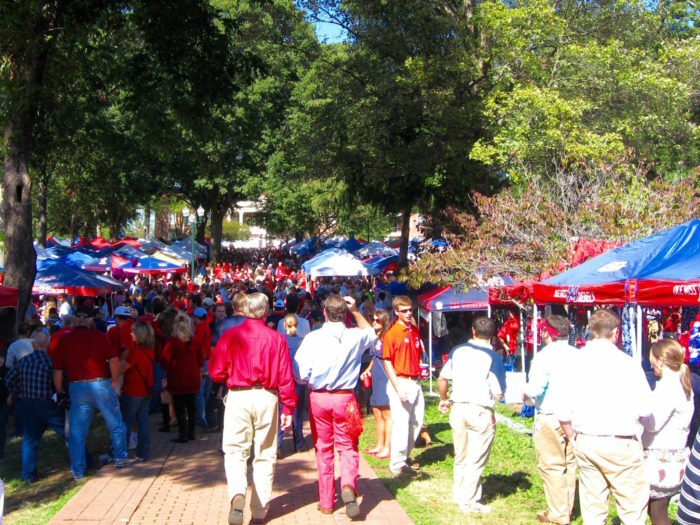 Coveted tailgating spots include The Pit, right next to the stadium, and The Gardens, a green-filled area close by the stadium. Fans sporting Razorback hats partake in calling the Hogs, “Woooooo, Pig Sooie,” and hit the famous Dickson Street apres game for more rollicking revelry. Shade is at a premium for Florida tailGATORS. Every oak tree on campus has tailgating tents sitting beneath. Blackened Gator tail, boiled shrimp and anything with Florida oranges are the go-to foods. Hot, humid fall Saturdays make for some miserable games for the visiting team … that and the thousands of fans “Gator Chomping.” Florida children learn early how to place their hands just right and CHOMP. The marching band plays a two-note music sequence from “Jaws” and everyone chomps their hands together. 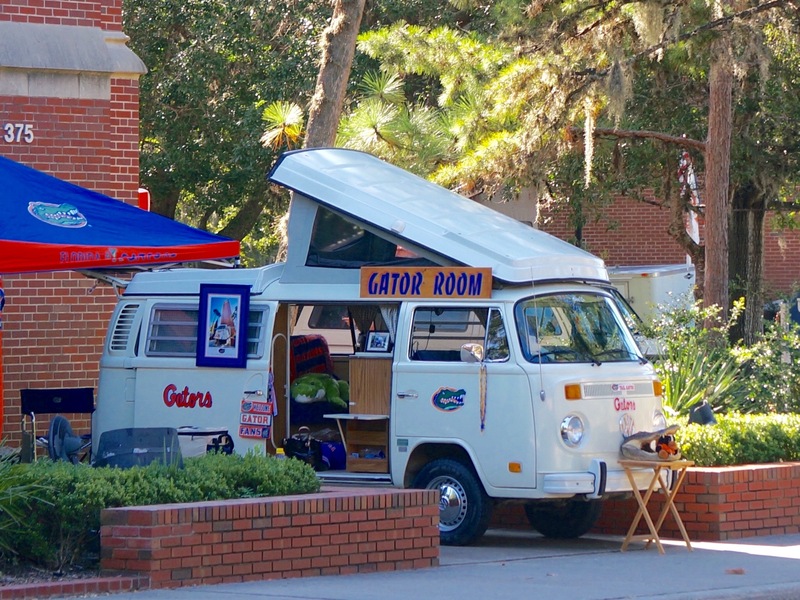 The Chomp is a syncopation thing and the fans do it very well … and they do it all game long. 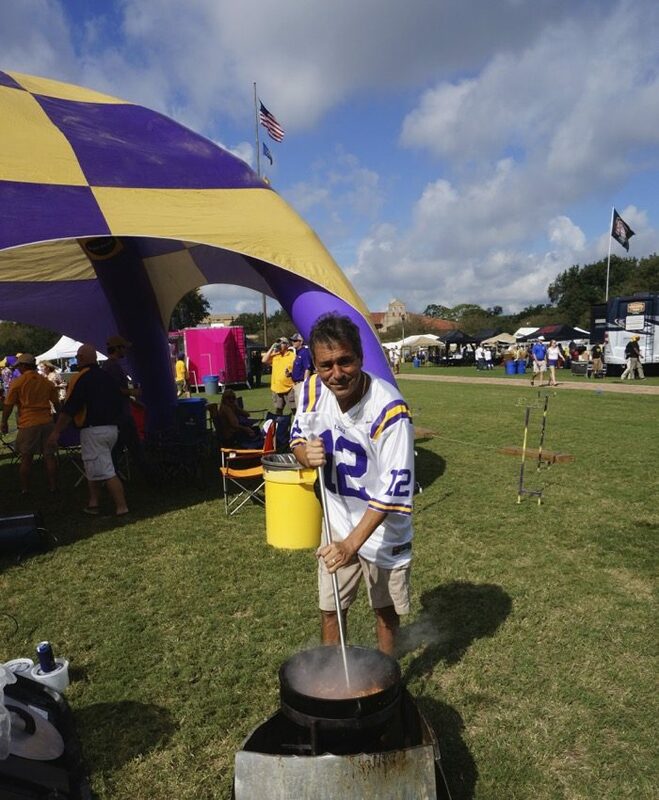 Tailgating in Baton Rouge is all about the food … and not just the usual barbecue, hammies and slaw. Think Cajun, Creole and French as in “Geaux Tigers.” Louisiana cuisine, i.e. muffalettas, crawfish, blackened alligator, and boudin are as unique as they come. Jambalayas, gumbos and picadillo, which are all defined by the Cajun holy trinity — onions, green peppers and celery — make for some seriously fun tailgating stirs! The place to tailgate on a football Saturday in Starkville, MS, is The Junction, a once “Malfunction” Junction of roads and railroad tracks. And then, there are the Cowbells. Cowbells are highly coveted and handed down through generations of MSU fans. These cowbells are used to help ring MSU to victory and sit proudly on tailgating tables across campus. The stadium in College Station is famous for the “WELCOME TO AGGIELAND, HOME OF THE 12TH MAN” signs that sprawl across the bleachers. The 12th man being the students of today and alumni of the past. Aggies don’t have cheerleaders. They have Yell Leaders, and boy do they YELL! 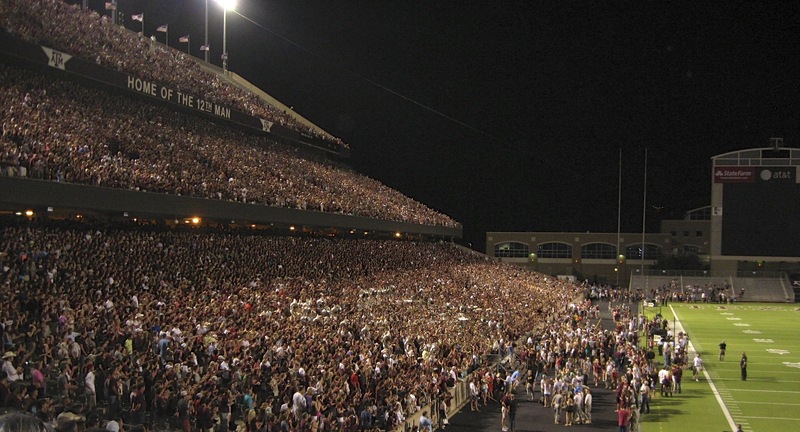 One of their best tailgating / pregame traditions is the Midnight Yell. Every midnight before a home game, students, the band and the yell leaders fill the student side of the stadium for a spirited and raucous pep rally. And don’t forget to try the preferred food at Texas A&M tailgates — the brisket — which is out of this world. When you talk about tailgating at Tennessee, you have to talk about the Vol Navy. 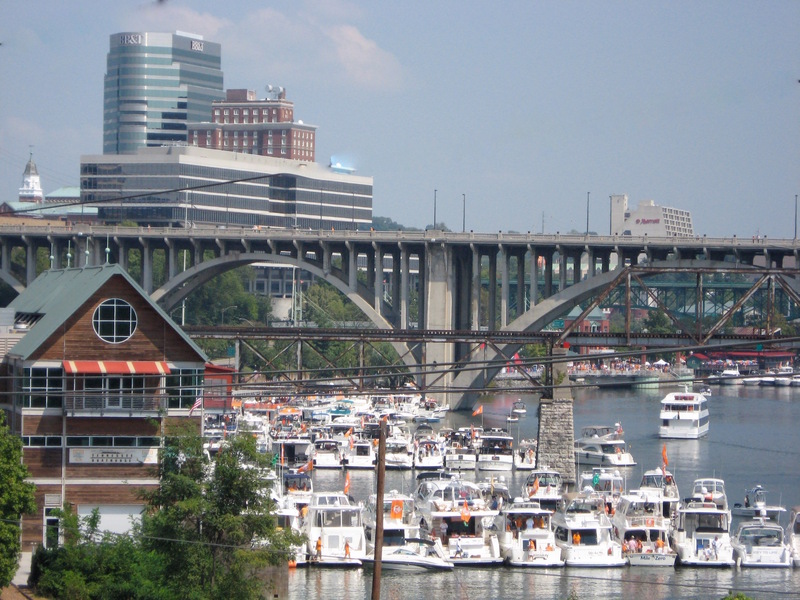 Seeing hundreds of boats making their way up the Tennessee River to dock right outside the stadium is a sight every fan should experience at least once in their lifetime. Once inside the stadium, the orange and white checkerboard in each end zone makes Neyland Stadium one of the most recognizable stadiums in the country. Nothing says football fun more than 102,000 fans singing Rocky Top! 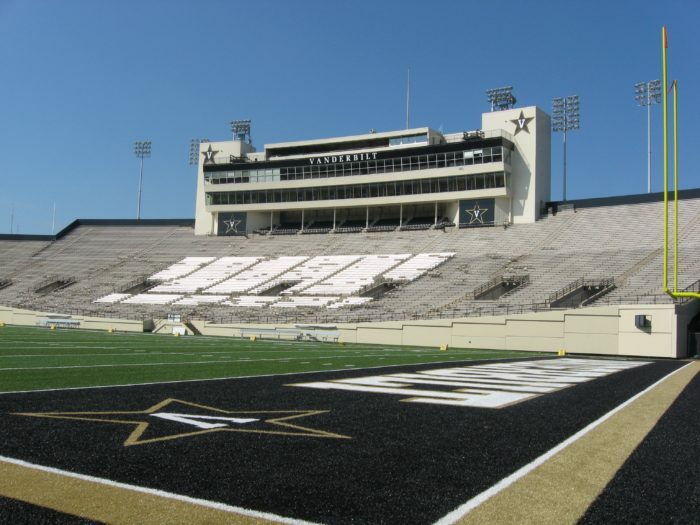 The Zou refers to the Mizzou stadium with its famous “M” formed by white painted rocks. On gamedays, Truman The Tiger can be seen exploding on the scene in a yellow and black vintage fire truck. Missouri tailgates always include a simple, yet delicious gooey butter cake — and pans of the cake can be found on all tailgating tables across campus. 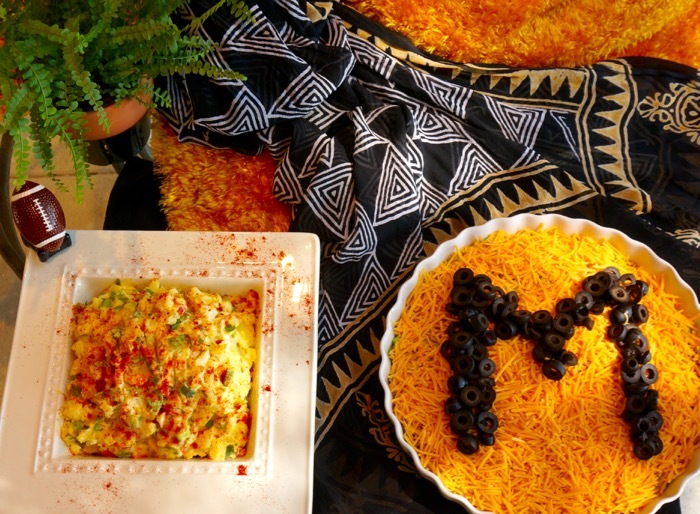 Another favorite amongst Missouri fans is the layered cheddar bean dip — usually created with the Missouri “M” made using black olives. 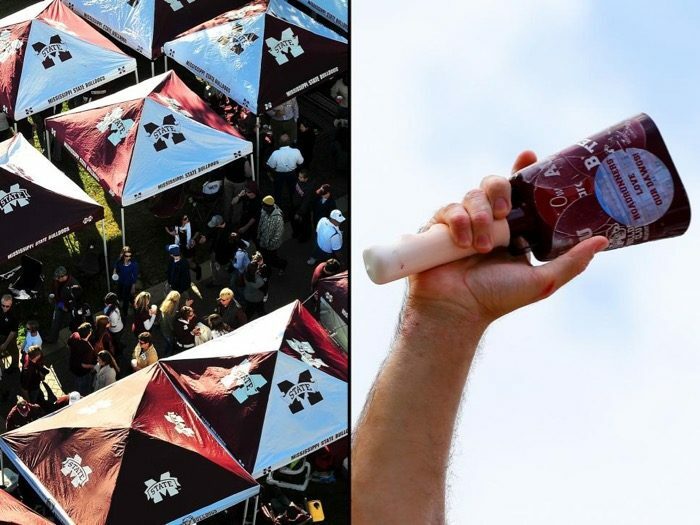 South Carolina offers up one of the most unique tailgating experiences in all of college sports. All schools have their tents, RVs, special traditions and even some have boats. 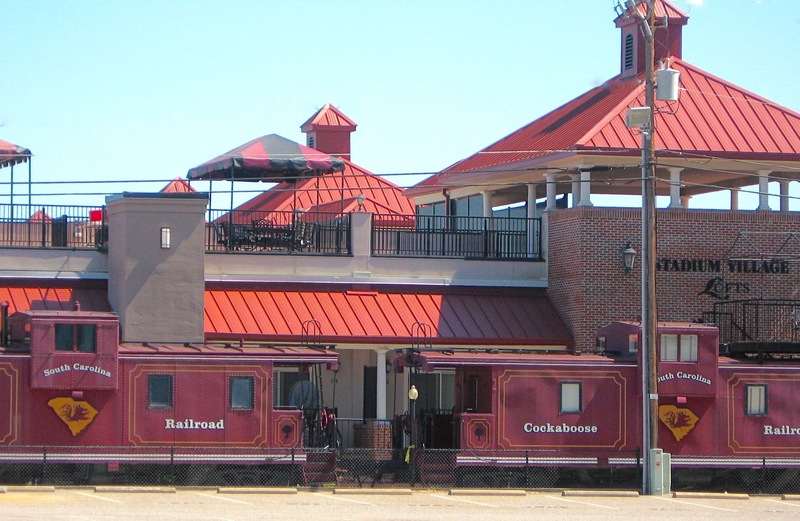 South Carolina however, has the “Cockaboose Railroad.” On gamedays, the Cockaboose Railroad is comprised of 22 garnet-painted cabooses sitting on dead tracks right outside the stadium, uniquely decorated by their owners and full of rowdy fans, tasty food and delicious drinks. 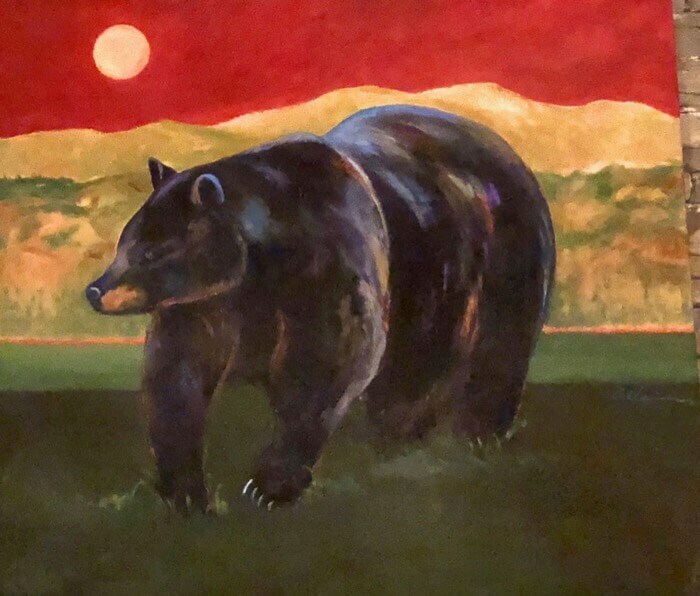 Tailgating in Lexington, KY, has a nice twist to it … at least during the 3 weeks in the fall, when fans can place a few bets at Keeneland Race Course and then go to a football game in Commonwealth Stadium. 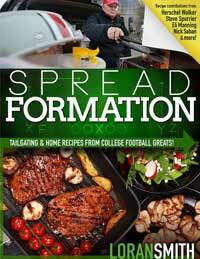 Kentucky tailgating centers around its legendary foods. 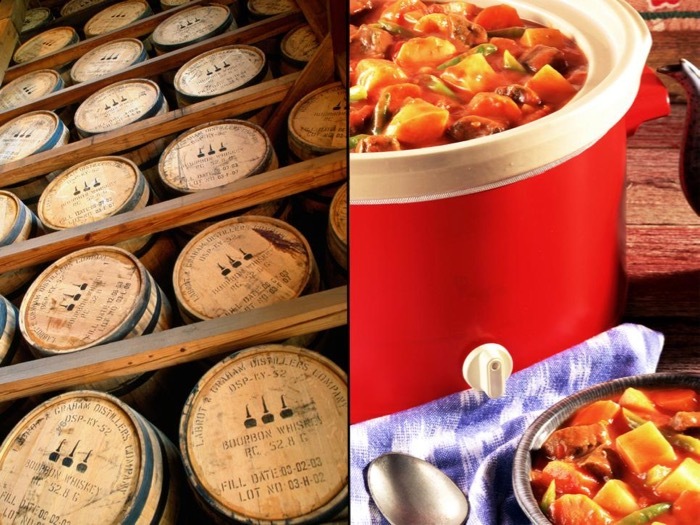 Kentucky Burgoo, Baby Hot Browns and many other specialties with a little Kentucky bourbon added to the mix are on the top of that list. Run For The Roses Pie, a bourbon-laced party pie, and the famous mint julep are also a big hit when it comes to gameday treats. The Natchez Trace is closed to car traffic on gamedays to create Vandyville, a tailgating mecca of tents, tailgaters and fun. In the fall, shimmering gold trees line Vandyville reminding all of the gold and black school colors. After the game has been played — win or lose — the fun continues as many fans hit a few Nashville music row bars to keep the tailgate going all night. 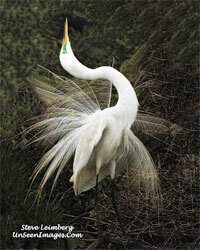 THANKS TO GREAT AMERICAN COUNTRY FOR THE COLLABORATION! 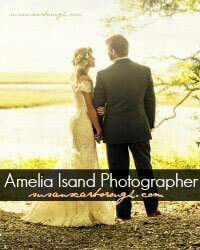 CLICK HERE TO VIEW ON THEIR SITE. Trying to decide where to claim my seat at the table. Either at the Zou for the gooey butter cake, or in Lexington for the Run for the Roses pie! I would say in Lexington if you like the horse races…could do both and eat some delicious bourbon laced pecan pie!